You've all heard enough already about Mozza -- Mario Batali helped with the menu, but hasn't been there since it opened; Nancy Silverton from Campanile is the other partner bringing her bread and pastry expertise; etc., etc. But now, the food. The doors to Mozza were still closed when we arrived for an early lunch reservation on the dot of 12, but in just a few minutes nearly every table was full, including all the stools at the wine bar and pizza bar. The room was decorated in a sort of restrained bistro motif with earthy vari-colored walls, immediately banishing all thoughts of the nasty tiff I had there with a boyfriend circa 1986 or so. The menu is short; mostly salads, paninis, a few sides, and Monday's main dish is chicken cacciatore -- all serving mainly to fill out the ambitious pizza menu with wonderful-sounding toppings of lardo, fennel sausage, salami picante and long-cooked broccoli. 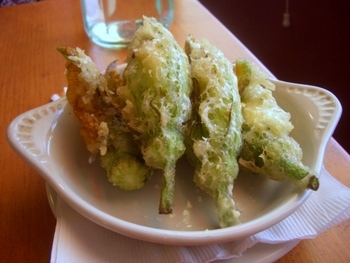 First came our fried squash blossoms with ricotta, perfectly crispy and hot and stuffed with mild, creamy cheese. Next up was the white bean bruschetta with radicchio on grilled toasts -- nicely savory, but I tend to think the combination of beans and bread is a bit too starchy. Our pizza arrived while we were still working on the first courses, with a touch of char on the crust for authenticity. I'm not sure I can recommend the wild mushroom pizza -- it's a tomato-less pizza, and the taleggio and fontina cheeses were a bit dry. 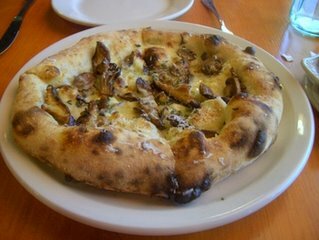 The overall impression was heavy on the well-calibrated crust, but a little light on satisfying gooeyness, although the wild mushrooms were tasty. I barely had room for dessert, but when I remembered the buzz over the butterscotch pudding, I decided to give it a try. The pudding was a revelation -- covered with a layer of caramel studded with fleur de sel, the silky pudding isn't overly sweet or heavy. I devoured the entire pot before I had time to contemplate the lovely little rosemary-studded pine nut butter cookies on the side. That's just a first impression, but surely I'll be back again soon to delve deeper into the pizza menu and try some of the main dishes. good review - from the way the picture looks, I'm guessing the pizza is about personal-sized? (which I hope is the case, since that means my friend and I can order and split more.) 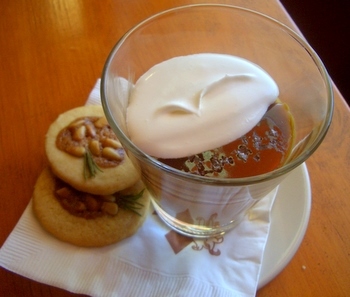 And the dessert looks like it had just enough sophistication w/o scaring anyone off. OOhh...I can't wait to try myself. Dylan and I finally got reservations early Dec. The Butterscotch Pudding--a revelation??? Oooooh! I went with a date on Sunday night w/o reservations and we took our chances at getting a spot at the bar. The wait was not too long and most definitely worthwhile. The real stars of the evening were the staff. The hostess was wonderfully helpful and actually checked on us while we waited, the bartender was amazing with his knowledge and food recommendations. He steered us to an amazing eating experience. We ended up sharing everything but the pizzas with the two couples on either side of us. This allowed us to try many other offerings from the antipasti menu. Everything was delicious! We were there a couple weekends ago. It is quite cramped and loud in there, but the food was great. I had the potato, gorzonzolla pizza. My son had the speck and pinapple pizza without the jalepeno's. 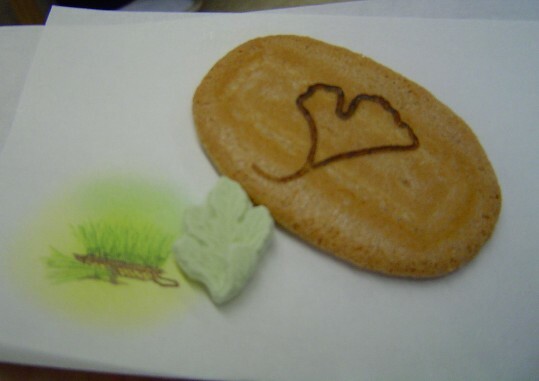 Both were delicious. Their iced tea I think was made with earl grey. It was refreshing on a hot day.